Shotgun Primer Inserts Now you can train your dog using inexpensive shotgun primers without the added expense of buying a primer pistol. Our solid brass inserts fit most any style shotgun and come in all gauges. 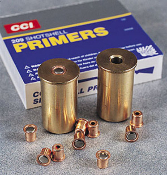 The standard 209 shotgun primers are available at most sporting goods stores. Professional trainers also use a shotgun instead of just a pistol because it teaches the dog to follow the direction which the gun barrel is pointed. This is great training to prepare a dog for retrieving from a blind or heavy cover. This product is sold individually and is priced so every trainer can afford one. Please specify 12, 16, 20 or 410.